When designing our furniture we have in mind your workflow. 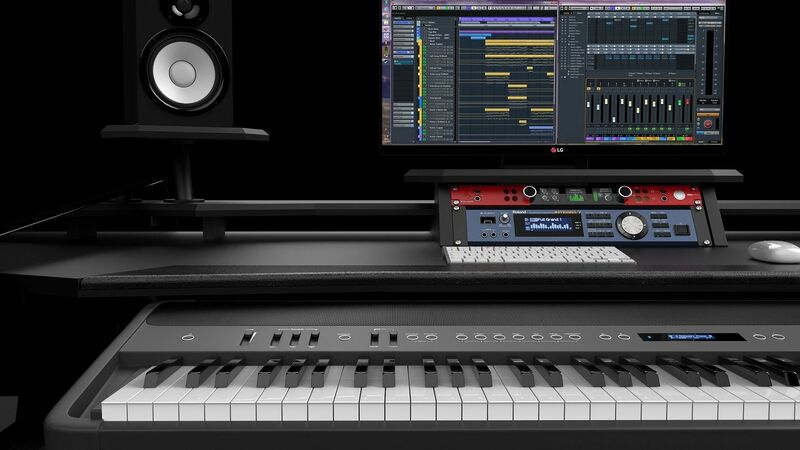 To create a piece of music, you need to be inspired. Your Inspiration highly depends on your workflow and your comfort. If something bothers you during your creative process, your inspiration can be drastically impaired. Our main focus is to produce beautifully organized space you always wanted to have. 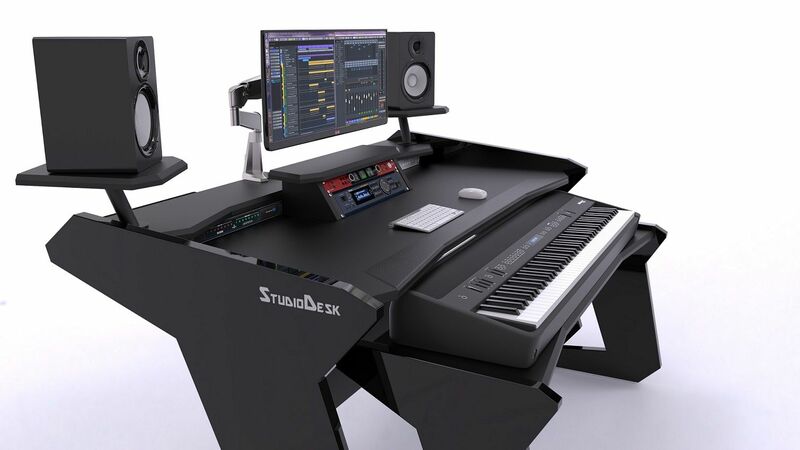 Enterprise desk was designed around modern DAW setup. 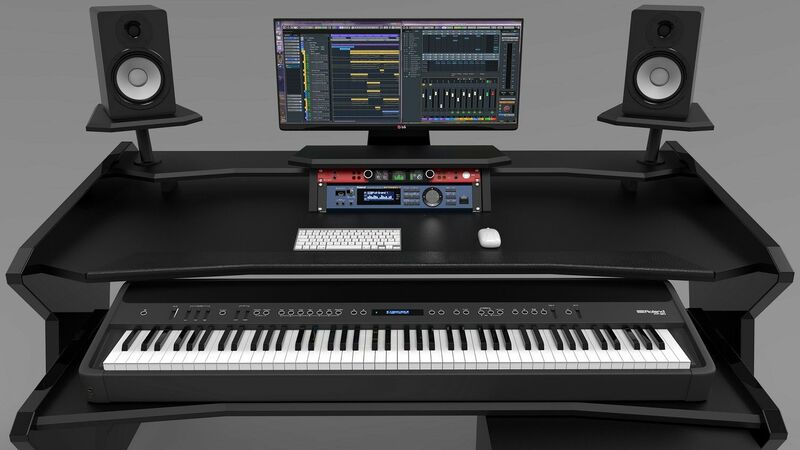 It is crafted with special care to meet all ergonomic and practicality aspects with strong attention to aesthetics making it unique workstation where everything is in the right place. 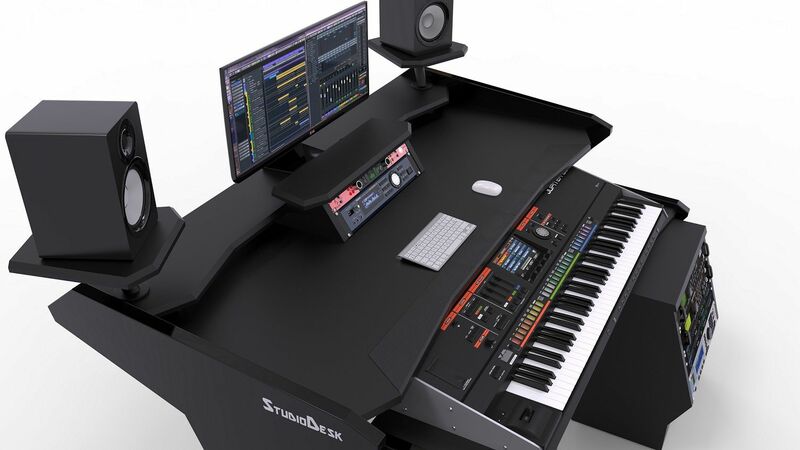 Lowered monitor shelf, elevated swivel speaker shelves, central rack placement, space for 88 keys in front of the producer are just some of the points. 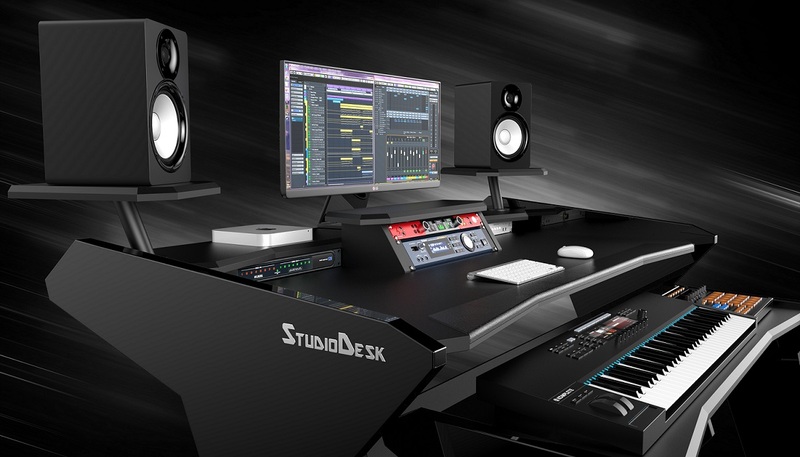 Put your equipment on the desk and let your creativity be unleashed. 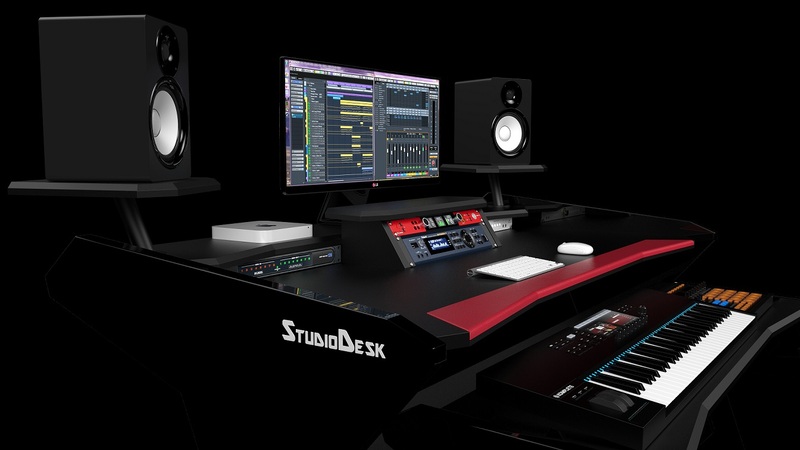 Enterprise desk gives you the ability to have the whole studio covering only 2m2 (21 square foot) of your space. It's spacious desktop surface will accomodate various gear and controlers. Lowered top shelf is long enough for two 27” monitor screens. 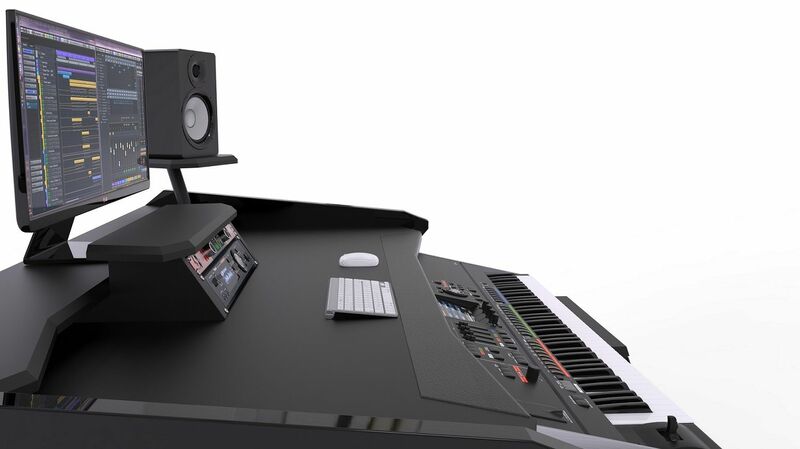 Swivel speakers shelves putting you in the sweet spot. 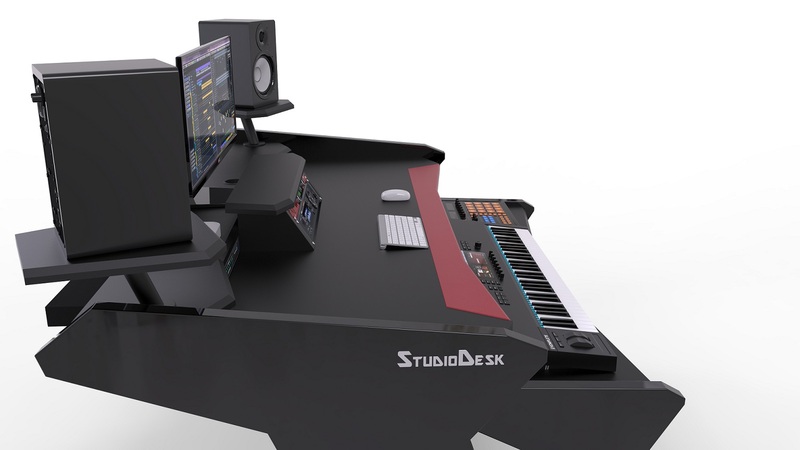 The front shape of the desk providing better access to your keyboard. A padded armrest is there to give you maximum comfort. 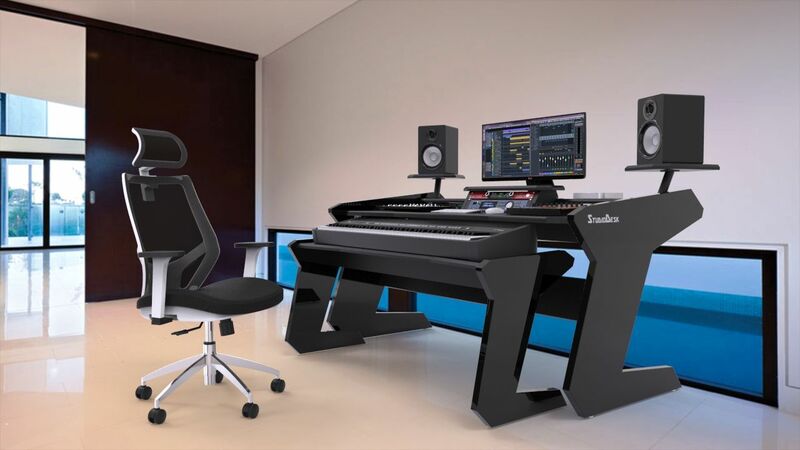 Keys of your keyboard will sit at average Grand Piano height for the best ergonomic experience. 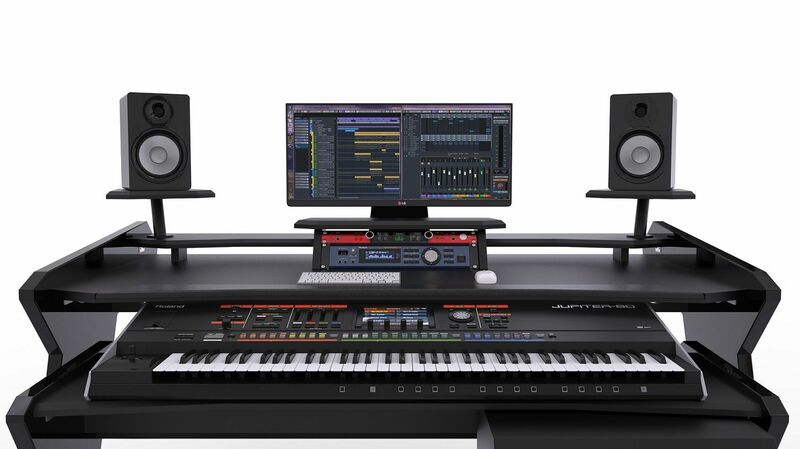 Keyboard stand is on durable casters for easy movements even on carpet floors. 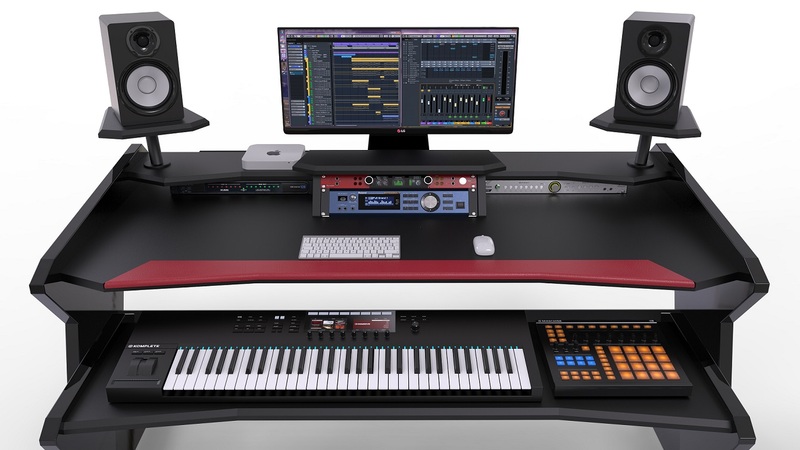 Ready to accommodate the biggest 88 key workstations on the market, Pull out your keyboard when you need it and push back under the main desk when you don’t. The large cable management under the main desk is keeping your cables away from your site. Centrally positioned rack bay with 3 U space is always within your reach. Two additional rack spaces are available under the monitor shelf. Add special spark to your desk with RGB LED Lights option. 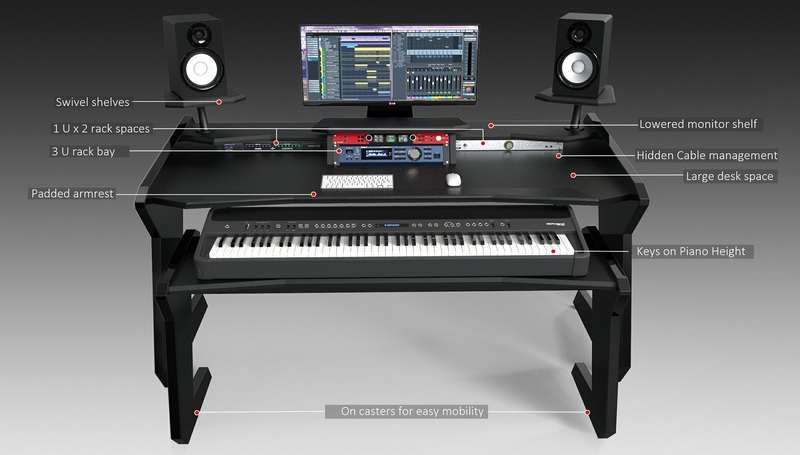 Add additional 8 U Rack space by installing Floor Rack cabinet beneath your desk or aside. Not sure which model is for you? 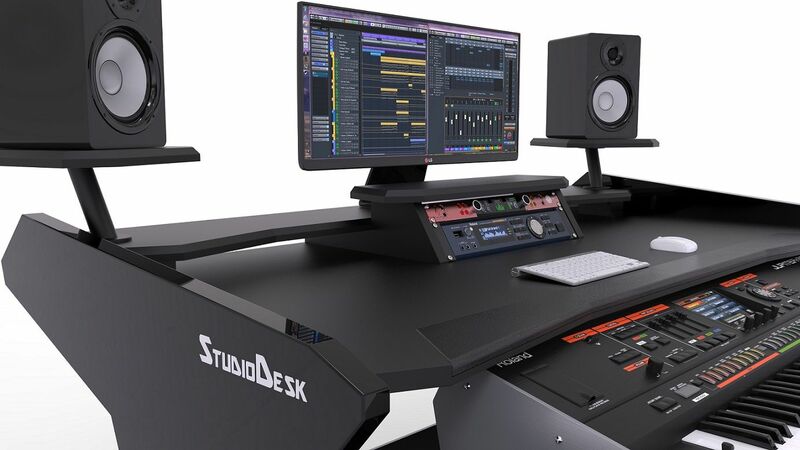 Our workstation desks are made to last decades. We utilize only high-quality materials with special attention to incomparable finish. Lacquering process used in our production is one of the best in the Industry resulting with the perfect shiny, glossy lacquer reminds to a mirror. The desk surfaces are finished with the durable matte non -reflective paint. We know how easy assembly is important to you. 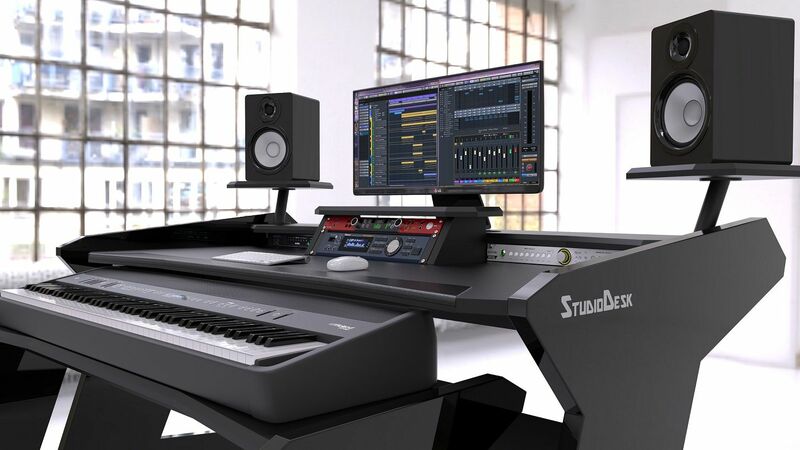 Our desks are designed to be assembled without any drilling. It can be assembled by anyone. To make your life even easier, we created a step by step assembly videos. All connecting components are thoughtfully planned. Your desk can be easily disassembled and assembled again on the other location if needed. All designs are made with attention to aesthetic and modern look which will be noticed by your visitors and not easily outdated. You really are the best in this thing and I’m willing to promote your awesome works…. Man, it's a work of art!! The design is killer, the construction is superb, the finish is stellar. It looks FANTASTIC. And it was super easy to put together. Well done man!! Hey man, the desk is great! I ended up making some changes to the desk though. Mainly adding rack rails on the bottom of the legs and different lights. We’re happy to offer our customers a flexible financing option powered by FuturePay. It is secure, convenient, and easy to use. Just select FuturePay when you check out so you can buy now and pay later. 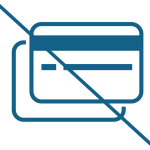 Why pay upfront when you can buy now and pay later – without a credit card. With minimum payment as low as $25/month, you can pay over time or pay your tab in full – the choice is yours! Our flat financing charge of $5/month for every $500 of carried balance makes it easy for you to know exactly how much it’ll cost to buy now and pay later. No complicated math or compounding interest rates to calculate. 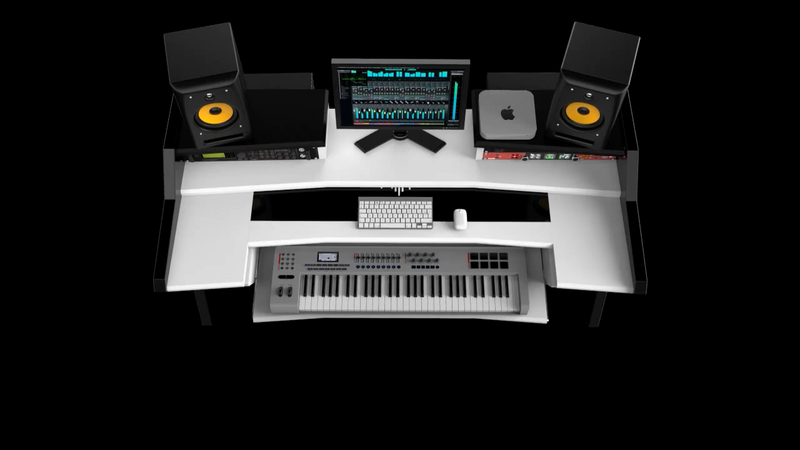 We do shipping of your Studio Desk as quickly as possible and in regards to available stock. In case that some items is not in stock, we will inform you accordingly. Shipping is Free for all orders over 1.400 € within continental EU zone. Shipping prices for order below 1400 € are covered during checkout. If your desired item is in stock we are going to organize shipping within 2 to ­3 working days from your order. If you place your order on the weekend, it will be sent out on the Monday or Tuesday. All parcels are sent out by a tracked door to door DHL service. Your tracking number will be sent to you within 48 hours of your order being sent out. All goods are properly packed for delivery and optionally insured against delivery damages. We recommend checking your parcel before sign delivery. If any damage occurs please report immediately to our email. In case something is damaged, we can easily reclaim damage from the insurance company and replace your item. If the desired item is not in stock, current waiting time is 30 – 45 days from your order. In this case, we are going to contact you. Please note: The expected delivery times below are given to us by the shipping companies, occasionally parcels are delayed. Allow extra time for your order to arrive and check your tracking number before contacting us. To country’s of European Union parcels are sent by DHL Freight door to door service tracked with tracking number on their website. Expected delivery time: 5 to 7 working days from shipping date. We highly recommend freight insurance against incidents. For parcels which are not insured, we can take any responsibility. 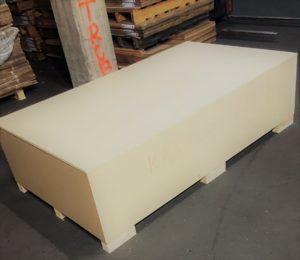 Our products internationally are shipped in collapsed form, packed in carton boxes and in custom made wooden crate on the pallet for maximum protection. If you live in the USA (including Hawaii, Alaska and Puerto Rico), your order will be sent out with DHL Air Freight service. Currently, our Worldwide service is shipped from our depot in EUROPE. All orders placed by Sunday will be shipped within few days most likely with the Tuesday flight. All orders placed by Wednesday will be shipped by coming Friday flight in accordance with DHL Air Freight schedule. Once goods are shipped it takes from 5 – 8 working days to reach airport near you. After goods arrive, a customs clearance takes a place. Customs procedure can be organized trough chosen broker. Please note: International orders can be delayed because of customs clearance. Allow extra time for your order to arrive and check your tracking number before contacting us. Please be aware that customs procedures and clearance of goods and additional fees by your country may apply. The most affordable shipping to US and CANADA is to Airport near you for self-pickup at rate of $180. Please note, self-pickup require to have some pickup or Van. The desk is delivered in the wooden crate with parts packed in the carton boxes and these can fit in any Van. If you don’t like to do self-pickup, we can offer Door to Door shipping in the US and Canada for a flat fee $290 only. Door to Door shipping includes Air Freight transportation and local delivery to your address. It doesn’t include customs clearance service and local fees, however, those services can be ordered during checkout for a flat fee of $220. Shipping price to any other country is covered in our shop during the checkout. If you are living in the different country from countries mentioned above, usually we are able to deliver to the Airport only. Please contact us for more information prior ordering. We are going to do our best to deliver to you if possible. Once goods arrive at the airport near you, you will have to organize self-pickup of the goods from the airport and do the customs clearance of your goods. Please get in contact with your local authorities about regulations in your country for more detailed information. Customs procedure – US and CANADA. Customs is an authority or agency in a country responsible for collecting tariffs and for controlling the flow of goods, including animals, transports, personal effects, and hazardous items, into and out of a country. Each country has its own laws and regulations for the import and export of goods into and out of a country, which its customs authority enforces. The import or export of some goods may be restricted or forbidden. In most countries, customs are attained through government agreements and international laws. A customs duty is a tariff or tax on the importation (usually) or exportation (unusually) of goods. If you are living outside of European Union, your goods will have to go trough customs clearance process prior delivery. If you are living in US or Canada and value of your ordered goods is under $2500, one of the best and cheapest ways to import your goods to US or Canada is to file for an informal entry. What is an informal entry please check here. How to file for it (in case you want to do it alone) please check here. You may want to file for informal entry alone or order this service during checkout, or hire any other customs broker in your aria. If the customer wishes, they may take the documentation of the entry down to the local custom’s port themselves, pay the duties due on the item and pick up the goods or file for informal entry and wait for our shipper to deliver goods after customs clearance is finished. If filing for an informal entry alone, you would need to know the arrival information and the correct tariff number ( HTS code) for items imported and country of origin which is, in this case, Slovenia. For arrival information, we are going to supply you with airway bill. If filing alone, the customer would need to know the arrival information and the correct tariff number ( HTS code) for items imported and country of origin which is, in this case, Slovenia. Duty rates depend entirely on the tariff of the cargo being imported. Tariff codes are so called HTS codes. For the RGB LED lights option HTS code is: 9405.40.8440 – this HTS does carry a duty rate of 3.9% of the value of the lights, so it will vary depending on how many lights the importer purchases. If sent via air, the importer would also have to Merchandise processing fees. The MPF for formal entries is an ad valorem fee of 0.3464 percent. The fee is based on the value of the merchandise being imported, not including duty, freight, and insurance charges. The maximum amount of the fee shall not exceed $485 and shall not be less than $25. For informal entries (goods valued at less than $2500), the minimum is $2. Based on our experience, customs clearance service, and merchandise processing fees ranges in between $140 – $250 which total amount mostly depend on the value of the imported desk. If you don’t want to deal with all these processes by yourself, we can offer full service for additional $170 (desk is cleared by our shipper prior delivery to your address). In this case, you are completely sure that what you pay is the final amount. If this is something you would like to utilize, please order this service during check out. 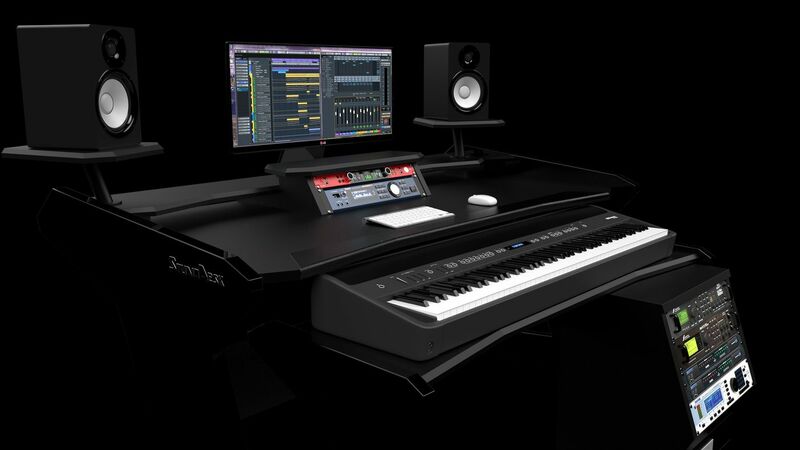 Returns and refund are considered only at the discretion of items purchased over Studio Desk furniture website and not his resellers. Only stock items will be considered for a refund (and then) only if they are received back at our warehouse within 15 days of purchase. All returns are subject to a 25% restocking fee. All return delivery, shipping, or postal charges are paid by the customer regardless of the size of the item. We will not accept items for a refund that have been damaged in any way. Every shipped package should be covered by strong insurance and will be replaced free of charge in case of damage caused by transport. If we receive an item within 15 days of purchase (and it is in the same condition as it was sold) refunds are promptly given*. There will be absolutely no refunds after 15 days of purchase. 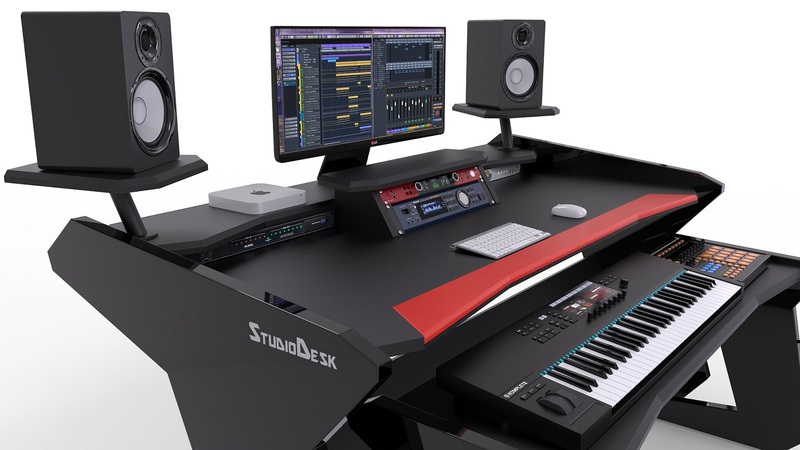 Store credit may be issued at the discretion of Studio Desk website. Proof of purchase (receipt and/or invoice) is required for all returns. Credits will only be issued to the credit card used for the original purchase. The value of missing accessories and any applicable open box fee will be deducted from the credit amount of the return. Delivery charges are non-­refundable. If a customer has not been charged for delivery (free delivery), its value will be deducted from the refund.